The AGREE II has advanced the practice guideline enterprise. However, while rigorous development methods and explicit reporting are required, they do not guarantee optimal recommendations for the targeted users nor optimal implementation of the recommendations. The clinical credibility of practice guideline recommendations is understudied; yet, this concept is critical in order to optimize the capacity of PGs to improve health and health systems. 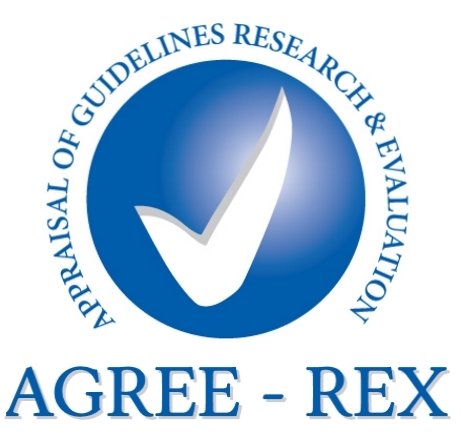 The objective of the AGREE-REX project is to develop a useful, reliable, and valid knowledge resource to complement the AGREE II, which will guide the development, reporting, and evaluation of the clinical credibility and implementability of practice guideline recommendations. As part of a previous project, the AGREE research team conducted a realist review of the literature to identify intrinsic factors of practice guidelines that affect their implementability. Factors identified in the realist review were organized into a model called the GUIDE-M. The content and structure of the draft AGREE-REX was based on one domain of the GUIDE-M, called the Deliberations and Contextualization domain. Studies involving international practice guideline developers, guideline users and researchers are being conducted to assess the validity, reliability, and usability of the draft AGREE-REX. Feedback received from these studies will be used to refine the tool and create a final version of the AGREE-REX. The research team has successfully developed the draft AGREE-REX, comprising 11 items addressing four key concepts related to the clinical credibility and implementability of guideline recommendations: evidence justification, clinical applicability justification, values justification, and feasibility considerations. The AGREE-REX has undergone two rounds of testing. First the initial face validity testing and second, the reliability and usability testing. We are currently reviewing the data generated from this study and refining the AGREE-REX as appropriate. We look forward to sharing the AGREE-REX tool publicly once the refinement process is complete. Funding: Canadian Institutes of Health Research (CIHR #125987).